S.T.O.R.M. Report Vol. 7 Special Edition No. 7 October 9, 2018. Let brotherly love continue...(Hebrews 13:1). 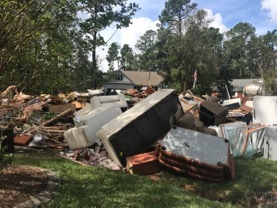 While keeping a close eye on Hurricane Michael* (upgraded to a Category 4 and forecast to hit the Florida panhandle today with storm surges of up to 14 feet), OPC Disaster Response continues to work with local leadership in North Carolina to provide help and relief in the name of Christ to those affected by Hurricane Florence. Despite our appeals for volunteers, and our thankfulness for those who have come forward and have served well, we are not hearing from as many people as we need! --Can your church round up a team to go and serve for a week? --Deacons, have you considered sponsoring a volunteer or team to come from your church? --If you or your team cannot commit to a week, how about just the weekdays or a long weekend? --Note that employers will often grant days off for disaster response volunteers. --Would you or anyone you know make a good Site Coordinator? --Skilled volunteers, this is an opportunity to make great use of your gifts! --Unskilled volunteers can come and support affected families and skilled volunteers in a variety of ways. Recovery from such disasters is a longer-term proposition than you may realize based on the rapidity with which they disappear from the news! * Update Oct. 12: Hurricane Michael: OPC Spared! Click here for the report!